The UCL Centre for Holocaust Education became a part of UCL (University College London) in December 2014, as a result of the merger between UCL and the Institute of Education (IOE). 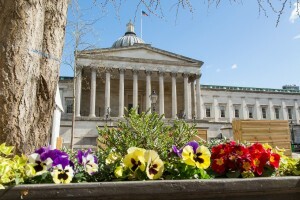 The Centre remains located within the now UCL Institute of Education which was ranked number one worldwide for education for two years running in the QS 2014 and 2015 World University Rankings and is recognised by Ofsted for its ‘outstanding’ teacher training across primary, secondary and further education. In the most recent Research Excellence Framework (REF) half of the Institute’s research was judged to be world-leading (awarded the highest grade of 4*) and it was ranked first for research strength in the field of education across all UK Universities. The UCL Centre for Holocaust Education is the only institution in the world to combine research into classroom needs with programmes specifically designed to enable teachers to meet those needs and challenges. Established in 2008 and formerly known as the Holocaust Education Development Programme (HEDP), we work in partnership with Pears Foundation and are also funded by the Department for Education (DfE). The HEDP was awarded Centre status and subsequently renamed in 2012. In 2009 we produced the first national empirical portrait of English teachers’ attitudes to teaching about the Holocaust and have just recently published the world’s largest study of young people’s understanding of this complex and emotionally challenging subject. In responding to this research, we are uniquely responsive to teachers’ and pupils’ needs: our teacher development programmes and educational resources address the key issues and have significant impact on teaching and learning. Our pathway of professional development targets teachers’ needs at every stage of their careers. We are the only institution in the field whose teacher development is quality assured – our Masters course, The Holocaust in the Curriculum, is validated by UCL* and has a chief examiner from the University of Oxford. All of our CPD courses conform to university standards and are therefore answerable to the QAA (Quality Assurance Agency) for Higher Education. In keeping with its mandate as part of a public university, we ensure the Centre’s expertise is available to a range of national and international institutions. We are an international hub for collaboration, evaluation and consultation and are recognised as a world leading institution for the development of research, teaching and learning about the Holocaust. Watch this short film to discover more about the scale and impact of our work. When the Centre was established in 2008, despite the activities of many institutions promoting teaching and learning about the Holocaust in England, very little was known about the extent and nature of teaching about the Holocaust in schools across the country. In response to this we undertook the first national investigation into teachers’ practice and perspectives, comprising an extensive survey of more than 2000 teachers and in depth interviews with a further 70 from schools across the county. Key challenges that emerged from the research included the limited amount of curriculum time available for Holocaust education; gaps in teacher subject knowledge; a tendency to tell the history from the perspective of the perpetrators rather than the victims; a lack of focus on pre-war Jewish life and victims’ responses to the unfolding genocide; and little attention given to the aftermath, significance or legacy of the Holocaust. Strikingly, the vast majority of teachers had received no professional support in how to teach this complex and emotionally challenging subject and 77% of teachers expressed a need for specific CPD on Holocaust education. You can read the final report in full. The Centre’s professional development programme was developed in response to these findings and we continue to ensure it is responsive to the needs and challenges faced by teachers in classrooms today. Just recently, we have published our second major piece of ground-breaking research, this time examining what students know and understand about the Holocaust. We drew on contributions from more than 8,000 11-18 year olds through a comprehensive survey and focus groups to build the most detailed and authoritative national portrait ever created of students’ knowledge and understanding of an important historical event. Now available online you can download your copy of What do students know and understand about the Holocaust? or order a hard copy by completing our online order form. This hugely significant research found that by Year 10, 85% of students had learned about the Holocaust within school, with 83% believing it was an important subject to study at school and 70% of those who had learned about it in school wanting to know more. However, despite this widespread exposure to the Holocaust in school, our evidence shows worrying gaps in student knowledge and some concerning findings. For example, student descriptions of the Holocaust focused almost exclusively on what the perpetrators did to their victims, overwhelmingly the recurring refrain was ‘Hitler and the Nazis killed the Jews in the camps’. There were inaccuracies and misconceptions in their knowledge of victims, with just 37% of those surveyed knowing what the term ‘antisemitism’ means and a third of respondents massively underestimating the scale of the murder of the Jewish people, with 10% believing that no more than 100,000 lives were lost. While many of the findings are surprising and some troubling, what is certain is that the Centre’s latest research will play a key role in shaping the future of Holocaust education both nationally and internationally for years to come. Our own pathway of professional development, offering free CPD to teachers in English secondary schools, is under constant review and development and the findings of our latest research are already informing the design of our programmes and resources available to teachers right now. Our vision is to be a centre of excellence, working with schools across England and offering extensive support for those engaged in teaching about the Holocaust. We work to an ambitious plan, taking the Centre into 2016 to transform Holocaust education in England. More than 6,000 teachers have participated in the Centre’s programmes since 2009, with an estimate of in excess of a million pupils subsequently benefiting from our work.